I'm running the client but for some reason it seems to be stuck on a previous flight, which was done in an A319 at Brussels. I'm now in a 747 at Heathrow, but the client can't seem to "find" that? I've clicked on AUTO, but that didn't help at all. I'm thinking it might be a simconnect issue, but I'm not sure. What should I do? Thanks in advance. Failure to find the position is mainy caused by a connection error. In the case of EFB v2 connection is provided by FSUIPC. Please look at the STATUS window in the right upper corner. What does it say there? Is there any indication that the Simuator is not connected? It doesn't say the simulator is connected. It's just saying "Simulator" in yellow. However, I've just realised I've uninstalled FSUIPC the other day. I'll install it again, and will let you know. That solved it! It was all about FSUIPC being uninstalled. Thanks for the help! There are two things contradiction each other: "simulator in yellow" and FSUIPC working fine". 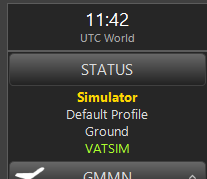 If "Simulator" is depicted in YELLOW it simply means that the Simulator has NO CONNECTION to the Server. Have you checked the proper version uf FSUIPC is in use? Dear lonewulf47 thanks for replying, appreciate it. i use FSX SE and Aivlasoft v2 build #61. it shows fsuipc well connected (see image attached). i also run fsuipc with a paid version see below as well. I see that you have your documents path set to a Cloud Drive (oneDrive). Can you confirm that also the EFB documents ase using this cloud path? EFB is not designed to work on any cloud, only within the computer's own (physical) drives. Virtual drives are not supported. I see that you have your documenzs path set to a Cloud Drive (oneDrive). Can you confirm that also the EFB documents ase using this cloud path? EFB is not designed to work on any cloud, only within the computer's own (physical) drives. Virtual drives are not supported. This documents path to the "Flight Simulator X - Steam Edition Files"is in fact (AFAIK) the correct default location for Flight Plans in FSX:SE. Did you change this folder earlier or did you have a double installation with "normal" FSX before? hi no i installed SE only on a new SSD. surprisingly both paths showed. i think issue is that fsx SE goes to get FP by default from FLIGHT SIMULATOR X while EFB detectes FSX SE and points to the FLIGHT SIMULATOR X - STEAM EDTION FILES path. 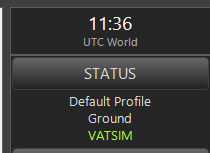 what i noticed is that when i load FP in EFB and changes SID for example, in FSX it totally loses the flight plan loaded. it becomes blank. Please let's take one after the other. We need to know which folder your FSX:SE is accessing for a *.pln type Flightplan. According to specs FSX:SE reads Flightplans from <Documents> "Flight Simulator X - Steam Edition Files". If EFB detects (correctly) an FSX:SE installation then this would be the correct path for any *.pln type Flightplan. Unfortunately not every FSX.SE installation uses this path as default, the reason for it is unknown to me. Now the first thing you need to look at is where the transfer-file for the GPS is located. The name would be: "EFB_current_gps.pln". Please check in which of the two documtens paths you see this file. Make sure that you use an A/C which has this automatic transfer enabled. To me it seems that for whatever reason I don't know - FSX:SE is accessing and using the FSX default Documents path. I muyt admit that I'm not familiar with the what's and whereabouts of FSX Steam Edition. When and why it is using the default FSX path is completely unknown to me. As a first remedy you can try to change the Flight Plan path manually. Do you have enough knowledge to manually edit a textfile? Ok, but first we need to sort out a few things about your installation. Please repot the build # of both Server and Client. That's ok then. Those are the most recent builds. I assume that you have standar installation paths. Then go to C:\Users\<Username>\Documents\AivlaSoft\EFB2\Server\Settings and look for the file "serverSettings.txt"
- Do not change anything else nor add any lines and save the file. - This should replace the Flight Plan path. hi i did as instructed. but the EFB current GPS file still appears in the previous directory. shall i delete it ? or move it to the Flight Simulator X Files path ? Die you check in BOTH directories and did you check the timestamp(s) of the "EFB_current_gps.pln" ? Could you please attach the SupportFiles? Ok, disregard the part about changing the storing path for Flightplans in the "ServerSettings.txt" files. This path is alyway read from FSUIPC and and thus not alterable. I wasn't aware of that anymore. In a newer build this path is not accessible anymore either. The point is that something with your installation seems to be wrong as FSX:SE is obvioulsy using the FSX Default Data path although in the registry the FSX:SE Data path is available. ATM I don't see any possibility to change this. Did you in the past change the FSX:SE installation in any way? no … anyway, we have tried.